Our qualified and experienced instructors can take you from beginner level to test standard and beyond, with a variety of course options that are tailored to suit you. 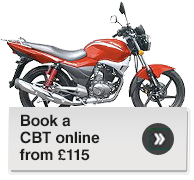 Based at A&M Motorcycles in Letchworth in Hertfordshire with training sites in the surrounding area. Courses can be taken on consecutive days or over several weeks if need be. Unlike many training schools, our course prices are fully inclusive and include bike hire, fuel, practical test fee where applicable, insurance* and any required safety equipment (e.g. helmet, gloves, jackets but not footwear).